A luxury Hotel with 190 rooms furnished in a period style, a Health Spa, and considerate personal service for its guests. Located in a 19th century palace in a residential area. Discounted rates. 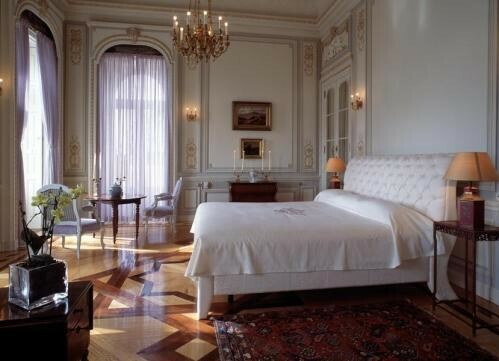 The Pestana Palace is a luxury Hotel and is located in a residential area to the west of of the downtown of Lisbon. It is also only a short drive to the Estoril coast and its beaches. The hotel is situated in a 19th century palace, which has now been fully restored to its former glory and classified as a National Monument. The Pestana Palace looks over an inner private park with many beautiful subtropical trees and plants, whilst enjoying panoramic views over the Tagus River to the 25 de Abril Bridge and the statue of Christ that overlooks the capital. This room features panoramic views of the city. Equipped with air-conditioning, a flat-screen TV, minibar and a private bathroom with free toiletries. Includes views over the gardens Featuring air-conditioning, a flat-screen TV, minibar and a private bathroom with free toiletries. This room comes with a balcony or a terrace. Featuring air-conditioning, a flat-screen TV, minibar and a private bathroom with free toiletries. A large suite with a separated living area and city views Featuring air-conditioning, a flat-screen TV, minibar and a private bathroom with free toiletries.